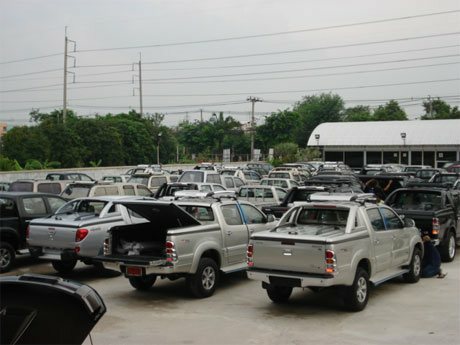 We sell not only vehicles, machinery, equipment, spare parts, performance parts. lights and accessories but also all sizes of new and used tyres of all kinds and all major brands. Bridgestone, Yokohama, Dunlop, Toyo, Goodyear, Michelin are just some of the brands we export and if you want our house brand we can also provide it at a deep discount. Jim carries complete range of Automobile Tyre & Tubes specialized from car radial tyres, pickup truck tyres, SUV tyres, MPV tyres, Light & Heavy Truck and Bus Tires both in Bias and Radial types, motorcycle tyres, three wheeler tires, LCV tyres, Agricultural Tyres, industrial tyres, Off The Road (OTR) Tires and Construction and Mining vehicle tyres. We have a tyre for all seasons and all purposes in new and used so whether you are looking for radial, OTR, PCR, LTR or TBR you have come to the right place. We can also provide tyre scrap of all kinds. New 2018 2019 Toyota Hilux Revo has revived the Hilux Franchise as it is a MAJOR change model in all respects. 2014 2015 Toyota Vigo Hilux Champ Thailand injected some life in the Vigo Thailand franchise and demand from customers have been unprecedented. It is available now for quick delivery at Thailand Toyota Revo Thailand Hilux exporter. 2018 Mitsubishi L200 Triton Thailand, 2018 Nissan Navara Thailand, 2018 Isuzu Dmax Thailand, 2018 Ford Ranger Thailand, 2018 Mazda BT-50 Thailand, 2018 Chevy Colorado Thailand and 2018 Toyota For2017 Toyota Hilux, 2017 Toyota Fortuner and other 2017 and 2018 pick-up trucks and 2018 2019 Sport Utility Vehicles.